You’d think a movie where Grimm characters Hansel and Gretel turn into gun-wielding, wisecracking witch hunting mercenaries would at the very least keep your attention. How could a premise like that manage to be boring? Well writer/director Tommy Wirkola (Dead Snow) miraculously found a way. Jeremy Renner and Gemma Arteton are the brother and sister of the title and they act like a 1980s buddy cop duo transplanted into a historical fantasy realm, complete with their comically large and complicated weaponry. Too often the film settle on such a lazy tone lacking irony or cleverness, settling for lame genre quips and a rote story filled with poorly developed villains. An action movie set in a fairy tale world is a great premise, and Hansel and Gretel seem like a perfectly capable pair of leads with their back-story. It’s a shame that this movie feels like it never went beyond a surface-level once-over when it came to developing its imagination. The action sequences are ineptly staged and ineptly edited, which kept me from feeling any longed after thrills or entertainment. It ends on a much better note with an all-out witch assault but by that point the movie has already worn out its welcome. 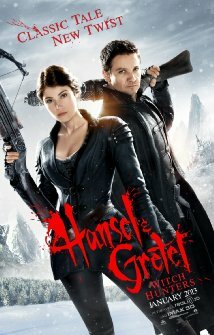 Hansel & Gretel: Witch Hunters, produced by Will Ferrell and Adam McKay, is another case of a great idea not given enough development to separate itself from the din of lame action. Posted on July 6, 2013, in 2013 Movies and tagged action, fairy tale, fantasy, jeremy renner. Bookmark the permalink. Leave a comment.